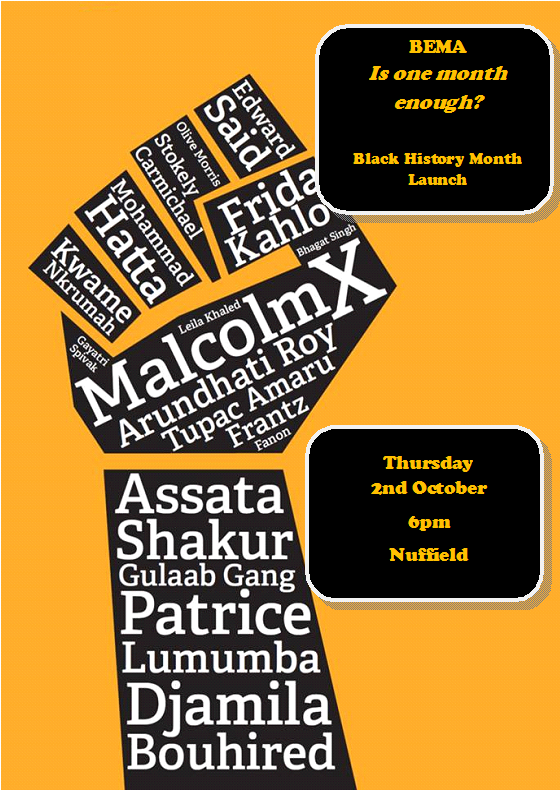 Black History Month launch: Is one month enough? In BEMA’s Black History Month 2014 launch event we address the question of whether a month in the year can ever really be enough to cover the diverse Black histories that formed the world today. Featuring renowned photographer Vanley Burke, who has been documenting Birmingham’s African-Caribbean community for decades through his photography, presenting his work. Also featuring Mo’Rhymes the Poet performing spoken word. BEMA launch our Black History Month 2014 series of events to celebrate the contributions of communities of the Global South throughout history, and to highlight the unspoken legacies of resistance of Black & Ethnic Minority people in the UK and worldwide. All events are free and open to students and the community. 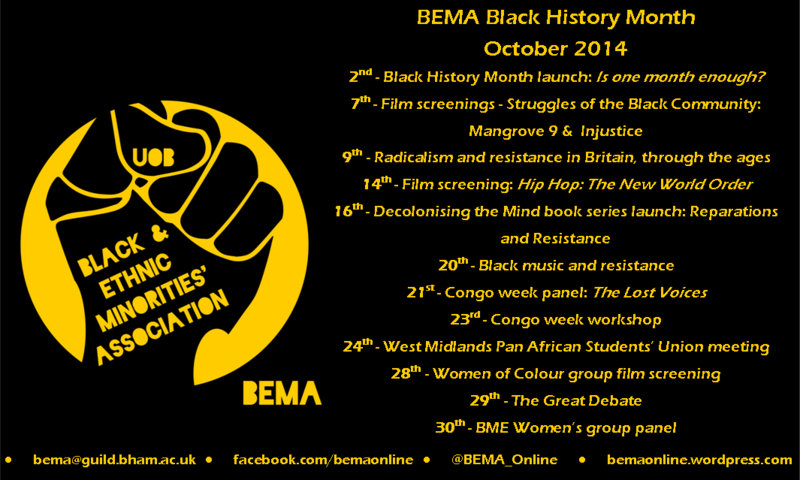 2nd – BEMA Black History Month launch: Is one month enough? 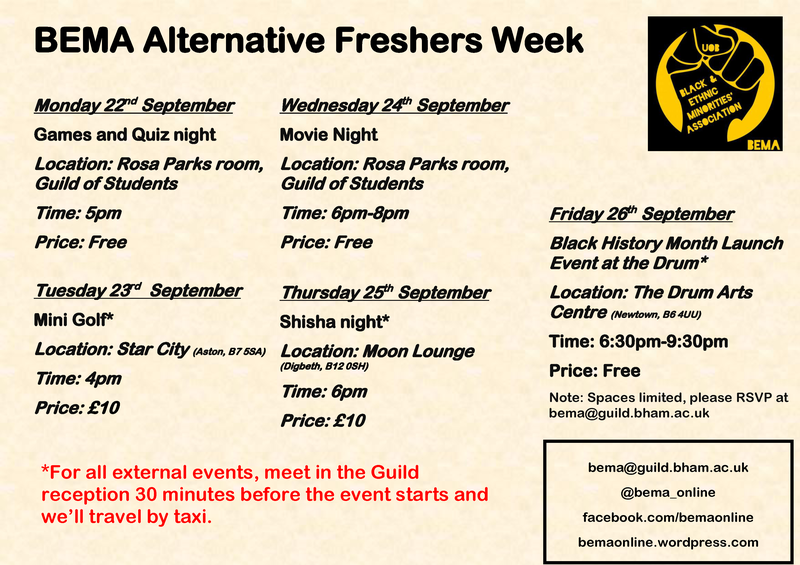 BEMA (University of Birmingham Black & Ethnic Minorities’ Association) are hosting an alternative series of events for Freshers week, open to new and returning students. Note: There are limited places for this event so please RSVP at: bema@guild.bham.ac.uk if you’re coming. You are about to embark on a remarkable journey; your first year at university! BEMA, which stands for (University of Birmingham) Black and Ethnic Minorities’ Association, is here for you to promote and protect the social, welfare and political interests of the University’s BME (Black & Minority Ethnic) students, and gives an opportunity to establish friendships with people from other cultures than your own. We work closely with other Guild bodies and the Ethnic Minority Students’ Officer of the Guild to promote the interests and equality of access to education for the University’s BME population. BEMA organises a variety of events throughout the year such as Alternative Freshers Week, our annual Black History Month, Imperialism Awareness week, panel discussions, film screenings, and socials. To stay updated with BEMA please email us at bema[at]guild.bham.ac.uk and we’ll add you to our regular mailing list – and you can contact us through any of the methods below too. We hope that you use your year to get involved with what BEMA has to offer, and look forward to meeting you at our events, and good luck with your first year.